I used a huge, fragrant bunch of cilantro this week for a pesto with an Asian flare, then tossed it into a stir fry. What I love about stir fries is that you can utilize whatever you have in your box, only a few extra items like onion or garlic need to be taken from the pantry. If you have this Asian pesto on hand, you can make a stir fry with just about any veggie. You could also mix it with ground meat and stuff it into a wonton skin to make a potsticker. 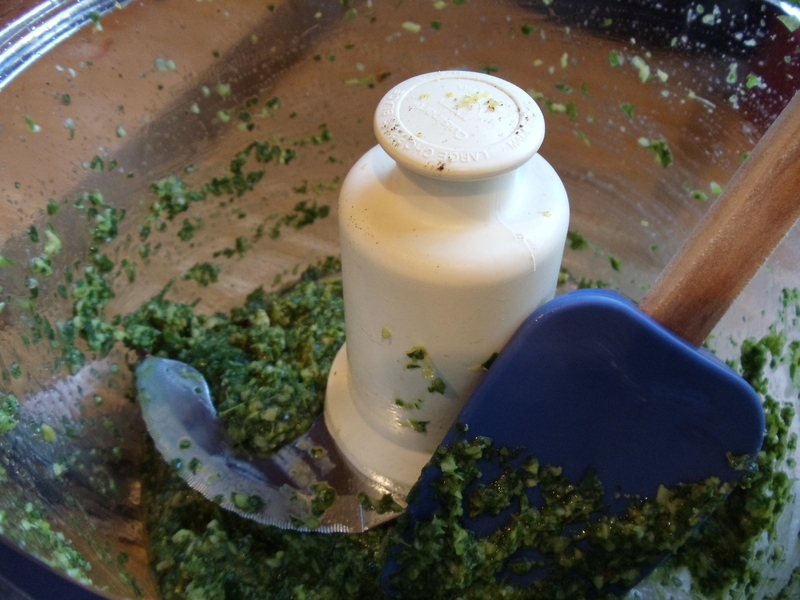 In a blender or food processor, combine the garlic, ginger, green onion, almonds, chile flakes and lemon zest and juice. Pulse until it is chopped into fine pieces, then add the green herbs and oil. Process until a thick purée is formed. Season with salt and pepper. Store in a tightly covered jar and refrigerate. Toss one pound of cleaned shrimp, (or you could use cubed firm tofu or chicken) with a quarter cup of Asian pesto. Cut vegetables into bite sized pieces. Divide vegetables into bowls based on levels of firmness: onions, garlic, carrots or any other hard vegetable into one bowl; celery, broccoli, peppers or any other medium-firm vegetables into a second bowl. Tender vegetables like spinach, bok choy leaves, bean sprouts into a third bowl. Heat a wok or large skillet until very hot. Add vegetable oil and heat until shimmering. Add shrimp and cook very quickly, for about one minute on each side. Remove shrimp from the pan. Add hard vegetables and cook, stirring frequently, for about 2 minutes. Add medium-firm vegetables and cook, stirring frequently, for about 2 minutes. Add soft vegetables, a tablespoon of Asian pesto, and 2 tablespoons of water. Cook for about a minute, until the vegetables wilt, add shrimp back in, and serve. Just to make the stir fry recipe more clear, you will need about 6-8 cups of vegetables to serve 6 people.